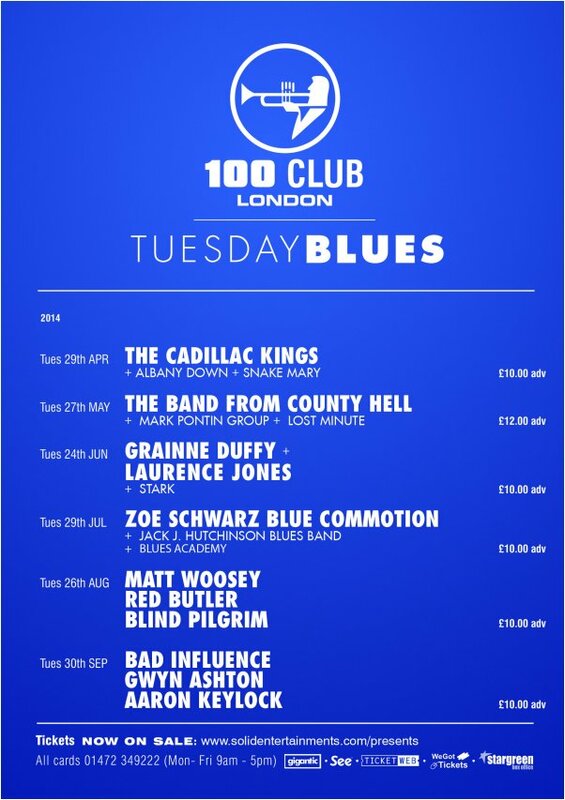 The band will be headlining the 100 Club, 100 , Oxford St. London W1 on Tuesday 30th September, 2014 at 9.30pm. + Aaron Keylock and Gwyn Ashton. Tickets are available from this website or from the band at gigs £10 in advance or £12 on the door. Also see www.solidentertainments.com for more info. We are playing Pakefield Blues & Boogie Festival on Fri. 13th September as a band, and Rich and Val will be doing a duo set on the Saturday lunchtime 14th at 12.30..
Paddy's leaving do this Saturday has now been opened to the public. It is free entry..all welcome..BAND!!! Please note that The Cavern in Raynes Park is starting up Sunday Afternoons with US!!! We will be doing the 1st Sunday of every month thereafter. Come down and support this great venue. Click on link to our Facebook page for first photos of Quofestive supports!! Times, details to follow. We hope to see some of you there!!! B.I. are pleased to announce confirmation of a support slot to the mighty QUO on Sat. 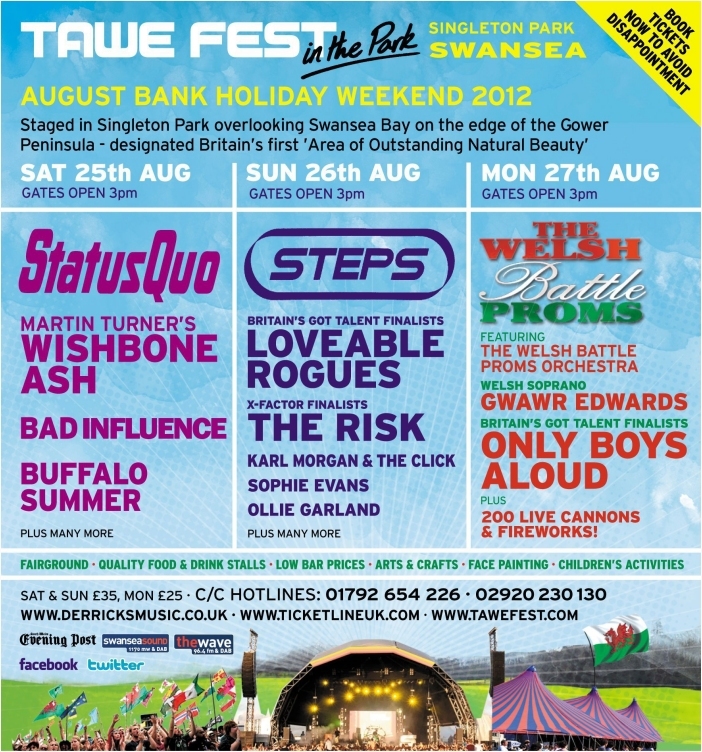 25th August in Singleton Park, Swansea, SA2 8QD. For tickets: go to the Status Quo website!!! Hope you are all enjoying the 2012 "summer"!!! March 2012 - With a live album in the pipeline, the band have some new venues booked for 2012...and some old favourites like ...these welcoming Billericay venues, The CRAWDADDY on March 8th and also BLUES ON THE FARM if you fancy a Saturday afternoon of Blues in June!! 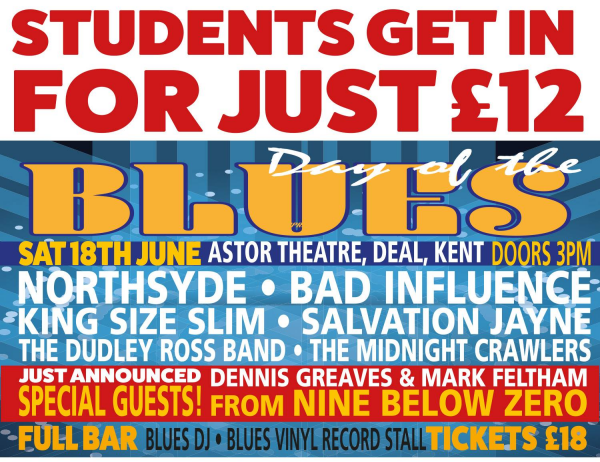 The Bads have also been confirmed for EALING BLUES FESTIVAL on Sat. 21st July - Mainstage. see website for details. Val will also be guesting with headliners ROBERT HOKUM and the GUV'NORS who will be celebrating 50 years of the infamous EALING BLUES CLUB. Other festivals so far include DREWFEST in June and the STAR BLUES FESTIVAL in Bentworth, Hampshire in August. New venues for Bad Influence will be Newbury Football Club in May , The Eagle in Arundel and The Riverside Club in Staines..keep coming to gigs!! We can't do it without you!! Featured gigs!!!... Bob Brookes' JOOK HOUSE in Worthing on Saturday 9th July. We've heard some great things about this venue so fancy a night at the coast? 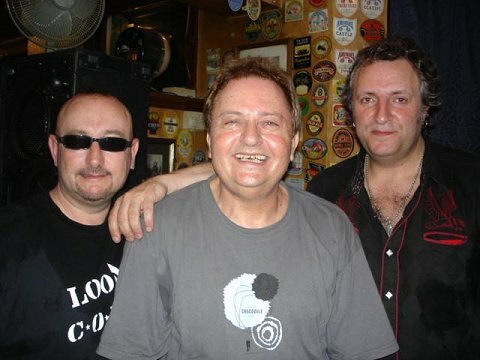 Another new venue for the TRIO will be RED ROOSTER BLUES CLUB at the Chequers Inn, Lamberhurst, Kent TN3 8DB. on Fri. 29th July. Thats Val, Richard and Pete. Don't forget the CAMBRIDGE ROCK FESTIVAL on Sunday 7th August and a little further into the year... BLUES IN TOWN - Chelmsford in aid of J's Hospice (tickets available now!...www.thejshospice.org.uk/events) on Sat. 22nd Oct. There are 12 acts on the day from Noon to Midnight and for a brilliant cause. These gigs cover quite a wide range of areas but if you have a decent venue near you that need Bad Influence...point them in our direction!! Summer is here! Have a good one!!!! We will be playing at the Cambridge Rock festival on Sunday 7th August. This is a weekend OR day event. Check out the event www.cambridgerockfestival.co.uk. We will be on Stage 2 at around 5pm and tickets may also be purchased through us here! Here's a sample of the issue with the Cover (right) and the Centre Pages (below). What a fantastic turnout at the Boom Boom at the start of this month. Thanks for all your support. So where now? Well we just keep going of course!! A new Radio 2 show being recorded in May, plus the cover of Blues in Britain and an interview -also May. Subscribe now!! www.blueprint-blues.co.uk. Plus we've been booked for the Cambridge Rock Festival in the summer! Keep on rocking!! 2011 is Bad Influence's 25th Anniversary year and we will be marking it with a special gig at the Boom Boom Club in Sutton (see gigs page) on Friday 4th March. Listening to our back catalogue of songs has been quite a journey and you can expect to hear a selection on the night. So many memories... Hopefully we can coax down a few ex-members of B.I. That would mean quite a few guests!! Hope to see you there. I think its safe to surface now Spring looks like it could be in the air... 2010!! Thank you everyone for your great comments about "Carousel". It means a lot and if you would like to vote for your favourite musicians in this year's British Blues Awards go to www.nottinghambluessociety.com. Val, Richard, Harry and Pete would like to wish you all a very Merry Christmas and a Happy, Healthy 2010 and thanks for your ongoing support and good wishes!! Val and Richard will be doing an interview for RADIO MARSDEN who are on FM radio 87.7 for the month of November. 10pm-12. The session with Findlay MacPherson will include tracks from the new album "Carousel" and chat about the history of B.I.. You can also listen online by typing clicking HERE...on Wedneday 18th November. Val, Richard, Harry and Pete would like to give a big thankyou to everyone who came to our album launch last Friday at the Boom Boom Club. What a fantastic turnout! Val on Radio 2 on Paul Jones Show, Monday 22nd June - 7pm backing ARTHUR LOUIS with Papa George, Sam Kelly, Pete Stroud, Paul Jobson, Steve Simpson , Helen Hardy, Noel McCalla and Bill Wyman's Horn section! ! phew Big Band!!! We have been double booked tomorrow night at the Globe so have been moved to The Lord Nelson, Enfield Rd. Brentford, apparently 30 seconds walk away from Globe. We will be there 9.30pm!!! It is a one off! Bad Influence perform Fly live at the Southampton 20 year reunion. Recording of the new album begins tomorrow and we are all looking forward to it!!! Album launch date and venue to be announced!!!! Most of you will know by now that Thunder are doing their farewell tour in July so check their site for dates! They will be playing at Hammersmith Apollo as will Pete Stroud with Buddy Whittington, supporting Gary Moore. The last day of Pete's British leg of the tour is there on Saturday 2nd May. Val will be doing 1 gig a month with Sam Kelly's PRIMO BLUE BAND from May. Val will be dropping the guitar for these gigs and will be fronting the band with Blues AND Soul covers. All gigs will be on B.I. 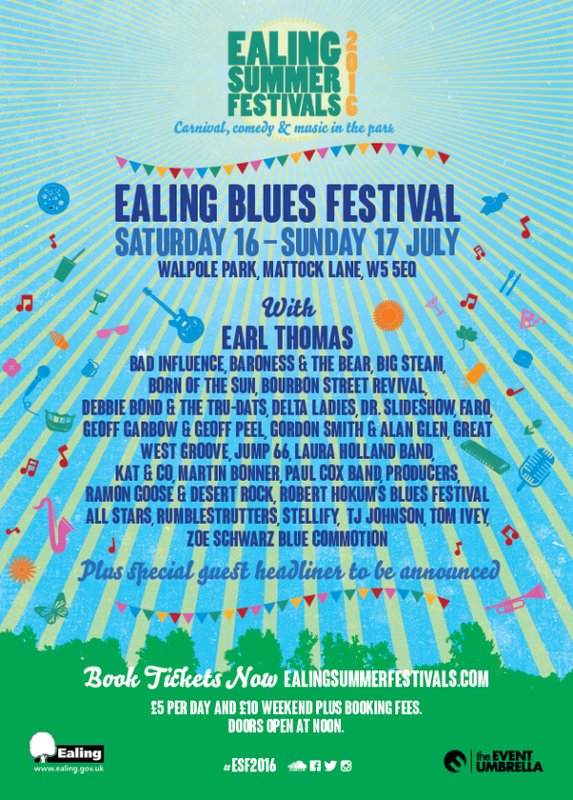 gig pages but put EALING BLUES FESTIVAL in your diaries on Sat. 25th July 5.30-6.30pm as it's a big one!!! That's it for now folks.... roll on Spring and keep coming to gigs!!!! keen to carry on with a great live music venue. Come along and support us on 27th Feb. and note that it replaces the White Hart in Ardingly who blew us out!!! A belated Happy New Year to you all, but long awaited news of our new album which is being recorded at the end of March so watch this space!! Also, our first 3 albums are now available on digital download. They are BAD INFLUENCE (plain - which many of you won't have) ONE WAY LOVE and LIVE, HERE THERE AND EVERYWHERE, all available from Townsend Records , follow this link http://www.townsend-records.co.uk/Bad+Influence. You can download single songs or the whole album. the Hammersmith Apollo on Sat. 2nd May. Thanks to you all for your support in 2008, may it continue in 2009!!!!! let you know that there will be a SOUTHAMPTON SURBITON 20th ANNIVERSARY RE-UNION GIG ON Saturday 8th November with us, The GARY BREWER BAND (GB'S) and PAPA GEORGE + STEVE SIMPSON. (in no particular order ha ha) It will be held at Kingsmeadow Stadium (formerly Kingstonian), now the home of AFC Wimbledon, Jack Goodchild Way, 422A, Kingston Rd., Kingston, KT1 3PB. Tickets on the door only - £10 - Bar to 1am. Get there early to avoid disappointment. Doors at 7pm. As many of you know Bob Skeat from Wishbone Ash comes in on Bass very now and again so Bad Influence have been asked to support Wishbone Ash at their annual convention in Chesterfield on Saturday 27th September. Pete Stroud will be bassman as usual. Anyone fancy it? raised monies for the Chinese and Burmese disasters! Many great guests! PAUL COX< The LOUDSHIRTS<ANDY CORTEZ and many others!! Unfortunately Val and Richard played the last gig at the Globe in Brentford last Sunday which is being turned into another gastro pub!! The band would like to thank Charlie and Beatha for many years of a great music venue!! We shall miss it!! Val says... I flew to the Isle of Man with the Primo Blues band last Friday.. That is.. Sam Kelly, TJ, Spy and Paul. The Big Wheel Blues Festival was on it's 10th year and gave us a very warm welcome. Michael Roach was on first, then me with Primo and Hamilton Loomis from Texas who was great! Check him out! He had a sax player from the states with him called Stratton and a rhythm section from here, Roger and Jamie who excelled!!! Thanks to all involved for taking care of me so well (especially the barman) who made the J.D. flow!!! (head wasn't too clever on the flight next day). Papa George and I literally passed each other at the terminal and he did same spot on Saturday with Primo. I think everyone was suitably knocked out and hopefully it will be B.I. 's turn next year! Duke of Edinburgh in Maidstone (finally) and a Littlehampton venue called the Cob and Pen which looks to be a great Sunday afternoon!! Finally, we are doing a gig for Dave Richardson of the Swampcats in Malden , Essex called "Beatroots" at the end of July which will take us up to our hols. California here I come, right back where I started from........Mostly pleasure, but a bit of business but I'll tell you about that later..... Enjoy the sunshine!!!! A BIG thanks go out to our stand ins while the boys are away... BOB SKEAT (Wishbone Ash) and CHAS CRONK (Strawbs) and more recently PETER REESE (Gary Moore) on bass guitar and on drums, JOHNNY MILLER (The Yards), PETE STROUD (Gary Brewer), CLIVE JENNER (Groove Armada) and more recently DARBY TODD (Papa George). All fantastic players, very incestuous business!!!! Hello everyone and Happy New Year!. The end of 2007 saw Val performing with the very groovy Primo Blues Band. Look out for further dates...... Whilst Richard plays with Ian Hunt , March sees our Pete Stroud doing a little tourette with Buddy Whittington who is John Mayall's guitarist. Don't miss this guy. He is great. Buddy noticed Pete's fantastic playing when he was with Peter Green. ( Our mate Bob Skeat of Wishbone Ash will be filling in.) Harry of course does his regular tours with Thunder!! Having said all that, we all come back together , Bad Influence lives on and we are working on our new cd! Long process I KNOW but these things take time and you can see how busy we all are! We had a great reception ooop Nawth in Darlington, were really well looked after and will be re-visiting again ! The Boogaloo Blues weekends have been great (on so many levels). Ask us.!?! The Crawdaddy in Essex and Boarhunt Blues Club in Hampshire are also new venues that have asked us back!! Just keep checking that gigs page! Finally, 2007 saw the passing of our friend MIKE JACKSON and unfortunately MAYFEST won't be happening this year but his partners Trevor and Richard will be carrying on with Walkern Music in Stevenage and have another venue opening too! Thanks for your endless support people and hope to continue seeing you all through 2008. MARSHA'S DAY at the Winning Post was a great success. The band had a great time. Really enjoyed Paul Brady and all the brilliant musicians who turned out for this worthy cause. Especially liked meeting up with Robbie Macintosh again (guitarist extraordinaire from Paul McCartney, Pretenders, Norah Jones and now the wonderful John Mayer) and Mark Feltham (Harmonica, now with Nine Below Zero and a band list as long as your arm), Brendan O Neil (also from Nine Below Zero and ex-Rory Gallagher). Brendan played drums for his daughters' band the Slummin Angels who we enjoyed immensely. Clannad lead vocalist had everyone spellbound. X Factor's Ben Mills was another special guest who did an excellent set and a very decent chap he is too! Denny Laine from Wings guested as did others but we were backstage quaffing wine then so didn't catch everyone!! See what some of you missed!!! It happens every September so put it in your diaries for next year!! LOOK!!!! We're going oop Nawth at the end Nov. Come on down all you people that have been asking me when!!! COMING UP!!.... Ex-owner of the Cartoon Noel has a pub called the Cavern, Raynes Park and B.I. duo will be there on 1st Dec. and Val is doing another gig on her todd with Sam Kelly's PRIMO BLUES BAND on 23rd Dec. at the Grey Horse, Kingston 4-7pm. THIS MONTH also sees Val recording with EARL GREEN and ROGER COTTON..... keep checking sites for news and gig updates....I know , I know!! new album is work in progress... you can't rush these things but it will be worth waiting for. Marsha's Funday on September 22nd looks to be a great day in memory of Marsha McDonnell in aid of The Shooting Stars Children's Hospice. Being held at the Winning Post in Twickenham, the event begins with a children's funday afternoon in the car park from 2-5pm. The doors open at 5.45 and the live music kicks off with the Slummin Angels at 6.30. BAD INFLUENCE are on from 7.15 for about 45 minutes, then Ben Waters, Paul Brady and Jeff Allen Allstars Soul Review finish off the evening. Bar to 1am. There will be many celebrity guests. Please come and support this wonderful charity. To mark the passing of Bad Influence's 20th Anniversary we thought that we would release a few memorable pictures which have been sent to in to us by original drummer Chris Sharley, pictured left of Val with Ray Knott (Bass guitar). This was before we went on stage at the Marquee (probably Wardour st. in 1989). Click here to see all the photos!! The next Windsor Castle Carshalton gig is going to be on a Monday! Easter Monday in fact, 9th April! We have a new Band gig in Maidstone in Kent coming up in May called York's Ale House and Val and Richard will be playing in Shropshire on the May Bank Holiday weekend on Mon. 28th at The Booze and Blues Festival in Clun. Details to follow.......The band will also be playing at The Thomas Tripp for the 1st time in Christchurch, BH23 1QD. All coming up.... keep checking the site for info! The session Val did for the Barcodes new album "With Friends Like These" goes out on Thurs. 15th Feb. between 8 and 9 pm on RADIO 2!! Friends include...Papa George, Paul Cox, Zoot Money Gypie Mayo, Jim Mullen, Roger Cotton amongst others and Val sings a Taj Mahal song ..."Paint My Mailbox Blue" - Tune in!! Following the success of the Barcodes album launch at the 606 Club in Chelsea (featuring Val amongst MANY others) they are recording a BBC Radio 2 show for Paul Jones on 9th January. 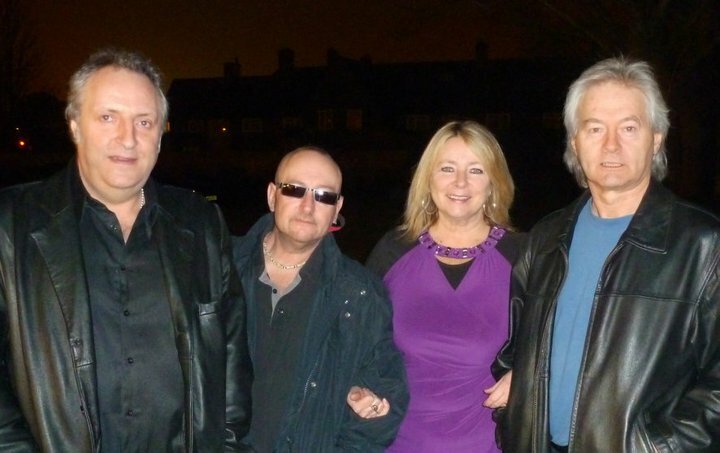 VAL has also been asked to do a gig with Sam Kelly's Primo Blues Band on Sun. 4th Feb. at The Grey Horse in Kingston, thats 3-5pm.!! P.S. Don't forget to go out and buy THUNDER'S new single this week to get it high up the charts!!!! a great venue, and of course the soundmen, Colin , Anna and Matt again! Please come down on the 19th and make our last gig a memorable one! There are still some rooms left at the Boogaloo Blues weekend at Cricket St. Thomas in Chard, Somerset on the weekend of Saturday 4th November. B.I. headline on the Saturday night (and Val and Richard doing an afternoon acoustic set). There is nonstop music from Fri. to Sunday in this Grade II listed building set in a wildlife park with superb indoor facilities. You can get the whole weekend, inc. half board for just £219 by quoting ref. RNB06 Call 0870 601 6012 to book. 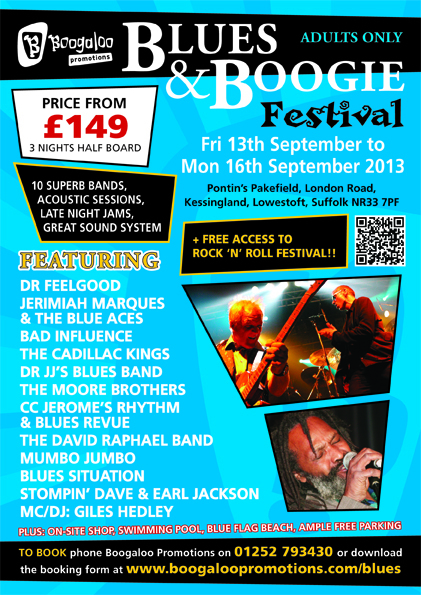 A new Boogaloo Promotions Blues Weekend over the weekend Fri. 3rd to Mon. 6th November is at Cricket St. Thomas Hotel in Chard, Somerset. The band will be appearing on the Saturday (4th). The weekend costs £219.00 Half Board Phone 0870 601 6012 to book quoting code RNB06 or visit www.boogaloopromotions.com. Another Boogaloo gig is on Thurs. 23rd Nov. at Farnham Maltings with Pete Stroud on Bass and Sam Kelly guesting on drums. Blake on photos and chauffeuring!!! Bad Influence have arrived on MYSPACE - Spread the word!!! Check out some tunes, pics, gigs dates and all the latest Bad Influence info here - and don't forget to add us to your MySpace friends list! 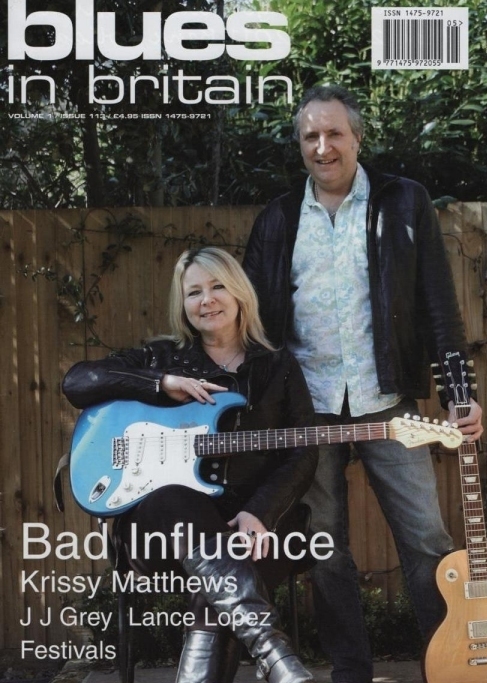 After the great write ups and CD reviews, BAD INFLUENCE have a track on the Blues in Britain CD 2006 entitled Best of British Blues which is out with the May issue.............BAD DESIRE of course!!!! www.bluesinbritain.org. Also check out the CD review in BLUES MATTERS by Pete Sargeant!!!! Val is going down to Roger Cotton's studio ROUNDEL in Kent next week to perform on harmonica virtuoso ALAN GLEN'S new album, along with PAPA GEORGE and PAUL COX. AND FINALLY, EVEN BIGGER NEWS!!!! We are coming up to celebrating 20 years of BAD INFLUENCE so look out for new releases and a special event later in the year!!! Our own Harry James played at the Albert Hall last Friday night as part of the Teenage Cancer Trust weekend. He was asked by Ian Gillan and Roger Glover of Deep Purple to join them in a set to raise money for this very worthy cause. Richard and Val have been invited to play at Tawe Delta Blues Club in Swansea, Wales next Tues. 13th December at their annual Christmas party, which includes amongst others the fabulous Papa George Band. The gig is run by Louise and Terry Williams who is the ex-Dire Straits drummer. Looks to be a great night!!! Weekend news: A good time was had by all in the Isle of Wight this last weekend!! The gig was great (not to mention the jam session with Papa George, Pete Stroud and Sam Kelly on the Friday). Thanks to Monica for organisation and cheerfulness (even at 4am) plus because of her a lot of people have the new album "Closer" in their mits!!! On Sunday afternoon we went straight to the Cartoon and although jaded had a real corker of a gig!! Oh and thanks to Tim Aves who organised the jams in IOW (have diplomacy will travel). us so well throughout the day! Pics are on Blues@theFort site already and our own Les Linyard's pics. will be put up soon . We had a very enjoyable photo session as you will soon see. Val and Richard's Live Xmas show for BBC Radio 2 from the Buttermarket, Shrewsbury called "Best Of British Blues" is being repeated on the Paul Jones Show on Thurs. 22nd Sept. 8-9pm. 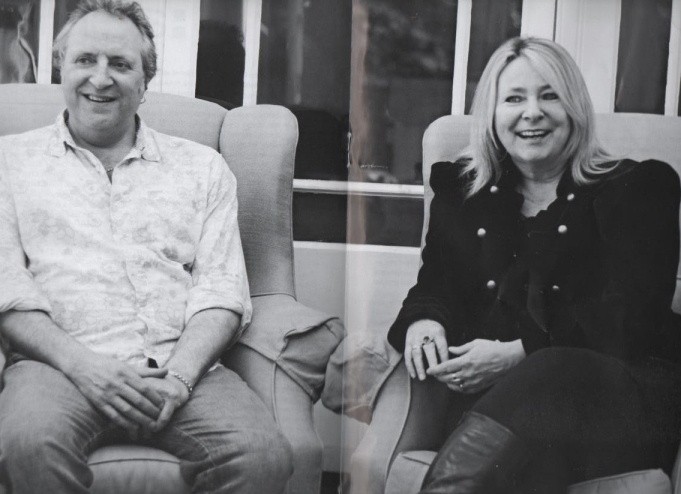 Val and Richard have done an interview for the 'Blues in Britain' magazine, which is out this month (September issue). For more info check out www.bluesinbritain.org. Last Wednesday, the track 'Tell Me' (from the fantastic new album 'Closer') was played by John Inverdale on Johnny Walker's Drive Time show on BBC Radio 2. For more info on the show check out http://www.bbc.co.uk/radio2/shows/walker/ - why not leave a message on the message board requesting more of the band on the show?? Last week's gig at the Walnut Tree in Yalding was a big success! The show was broadcast Live by BBC Southern Counties Radio to no less than 7 Counties!! We have had some amazing feedback so far - keep it coming!!! Val and the Boys would like to say a big thankyou for turning out from far and wide on Sunday for our Album launch and making it a great day. The positive reaction to the CD is fantastic! We hope to see you all again soon!!!! It's what you've all been waiting for... details of the official launch of Bad Influence's fantastic new album "Closer". The launch will take place on Sunday 17th July, 3pm at the Cartoon in Croydon with Bad Influence and special guests. DON'T MISS IT!! Album update from Val: "The date and venue for our Album Launch is imminent so keep watching this space!" "Our new album entitled 'Closer' is now recorded and mixed, but the manufacturing is taking longer than expected. Sorry people, but we know it will be worth the wait! We can also tell you that we have a very special guest on it! Any guesses? Won't be long. Val x. " Part 2 of the BI xmas show from Shrewsbury goes out tonight on Paul Jones Show Radio 2, 88-91FM. You can listen again on the Radio 2 website - click here to go there! "Hey guys, whilst Chris and Harry did their bit for the Tsunami appeal on the other side of London with Don Airey and The Illegal Eagles, Richard and I joined in an evening at the Grey Horse in Kingston with many other great artists. The night raised in excess of £3,000 so well done Richard (pub Guvnor) for putting it on and Robin Bibi for excellent organisation. The Boogaloo blues weekend at Littlecote House Hungerford was a big success so book your tickets now for the weekend of October 15th in the Isle of Wight when we will be on the same weekend with our mate Papa George! It has been reported that band members can be caught dancing around at the all night jam sessions at around 5am!? And that alcohol is involved?! We are also doing Farnham Maltings for Boogaloo on Thursday 12th May! A great venue, click here to visit Boogaloo's website for more info. Our long awaited album is coming on people. We are back in the studio this month. Look out!" 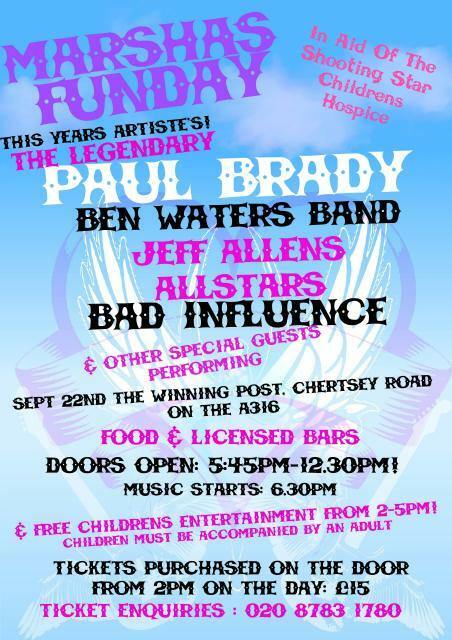 A special charity gig in aid of SEEABILITY has been organised featuring Bad Influence. The gig will take place on Saturday 27th November at the Ambassadors Club, Hangar Road, Tadley, Hants 7.30-11.30pm. Tickets cost £7.00 and are available from Gareth on 07793 411833 or 01189 821550. Following the success of Boogaloo Promotions' Big Blues Weekend in Hayling Island, Bad Influence have been booked for two more events next year. The first is at Littlecote near Hungerford in January and later on the Isle of Wight in October 2005. Book now and get looking forward to a great weekend! Click here to visit Boogaloo's website for full details. Ealing Blues festival was B. I. going down a storm to a few thousand bods!! We've had a call from Beeb Radio 2 producer Richard Masters who has asked us to do a show in December in Shrewsbury entitled The Best of British Blues. We'll keep you all posted as to when it's going out. Finally new album is work in progress. (if I had a pound for everyone that had asked me when???) We are aiming for winter release. In the meantime, keep coming to the gigs!!!!!!!!!! A few updates to the gigs page - keep checking in, things being added all the time. The album is available from Townsend and you can also visit The Stand website. BI went down a storm at our first Blues Weekend on Sat 13th March at Hayling Island. After breaking the record for the most CD sales EVER at ones of these events, our warm host Monica Madgewick has invited us to play at the Farnham Maltings on Saturday 12th June. Check out the gigs page for more details. These Blues Weekends are run throughout the year and they're fantastic value. Special thanks from BI to Tim Aves from the Rocking Armadillos for running the jam sessions and for all his support. For all you Welsh fans - Bad Influence are finally coming to Wales!! We will play at Talywain RFC on Saturday 12th June. Junction 24 off the M4 - is that near you!? We will be doing Blues at the Fort in Portsmouth supporting Sherman Robertson on Friday 24th September - this is a big gig!! Details to follow on our gigs page. Oh and last but not least Richard has a darts match down the local on Tuesday so wish him luck (ha ha ha!). Gigs updated: most importantly, from now on the Cartoon gigs will start at 3pm not 3.30pm. Don't be late! Val will be appearing as a special guest, along with Marcus Malone, Alan Glen, Roger Cotton and many more, at the launch of Papa George Band's new album "Down at the Station". All this takes place at the Bulls Head, Lonsdale Road, Barnes on Friday 19th March, 8.30pm start. Entrance is £8 and it's a night not to be missed! For more information visit Papa George's Website. Don't forget to check out the Bad Influence gigs page and get your social life planned from now til the end of April (yay!). There are still a few more to come so keep checking back. After a busy but happy new year, everyone is back and ready for another busy Bad Influence year. Especially the webmistress who has made a new year's resolution to pull her finger out! Any piccies, venue info, hotel info that would be good on the site (thank you so much for the things I've received already!) and check out the gigs page which is - up to date!! Just finished listening to the band live on BBC Radio Paul Jones Show - the gig in Newscastle - how good was that!! If you missed it, or you want to listen to it again, visit the BBC website where you can replay the show online as many times as you like for freeeee up until 8pm next Thursday. NEWS FROM THE BAND... at the end of September, Val was down in Kent doing some backing vocals on Papa George's forthcoming album. George teamed her up with Detroit bluesman Marcus Malone (who Val says has a wonderful voice) so you can look forward to that one coming out. Roget Cotton of Peter Green's Splinter Group owns the studio and engineered the session - also Peter Stroud popped in with cakies and gave Val a lift home (THANKS PETE!). He is bass man for Papa George and Peter Green! Small world, isn't it!? NEWS FROM THE USELESS WEB BIRD... sorry for the delay guys. Had a bit of a time of it lately, it all started when my car died on the way home from Harry's comeback gig and hasn't got much better since! Wrists are slapped etc. News just in from Val - Bad Influence are going to be on BBC Radio 2 AGAIN! More specifically, part of a live show including the likes of Johnny Marrs and Eric Bibb. The event will take place at the Newcastle Opera House on October 6th, to be broadcast on the Paul Jones show along with an interview with the band on October 9th, 8.00-9.00pm. Tickets will be available soon - full details are to be announced, keep your eyes on the Newcastle Opera House website in the meantime. Oh and finally, everyone say "woooooohoooooo! ", "augh!" and "wibble!" because the man with no hair will be back in September - yay! Don't forget to visit his official website and leave nice messages in the guestbook! 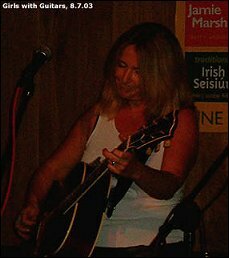 On Tuesday 8th July Val appeared at "Girls With Guitars", Porter House Bar Covent Garden. This was a showcase type evening also featuring several ladies who rock including Nikki from Never the Bride. There were great reports from all involved, Val played One Way Love, Ordinary Day, Miss You, a duet with Nikki for Bring It On Home and everyone got involved for Piece of My Heart. Big thank you to Mark for the picture. As you may know, Harry has been a bit under the weather lately and we're all thinking happy thoughts for a speedy return, in the meantime the gig schedule is as busy as ever with some fine guest drummers filling the hot seat so check out the updated gigs for July, August and September and get yourself out there (and don't forget to buy a t-shirt). If anyone has any more pics to add (Slob, thank you, I've got yours ready for the next update) I'd love to have them. Never mind the Loonies Board, spare a thought for northern web birds who get too tiddly to operate their cameras on the odd occasion they do get to a gig! Be excited, be very excited, it's finally here... BAD INFLUENCE MERCHANDISE!! T-shirts are now available, in black and navy, in all sizes, including v-neck skinny fit ones for the girlies (I won't be wearing anything else this summer!!). Baseball caps are also part of the new range. Priced at £12 and £15, you can purchase t-shirts and caps at gigs. Online purchase facility is currently being sorted out so fear not if you can't get to a gig, you'll just have to hang on a bit. Pictures to follow shortly - it's just all so new! Don't forget to check out the gigs page, April and May have both been updated including details of the Mayfest event on May 25th - check out the website, it'll be a goodun. News from the band - there have been extra rehearsals lately and as a result, four new songs in the set. "Are You Going to Go My Way" - Lenny Kravitz, "Stay With Me" - The Faces, "In My Place" - Coldplay and "Rock Steady" by Bryan Adams, all of which are sounding fantastic. A new studio album of original material is also in the pipeline for this year. There has been even more interest in the band since the appearance on BBC Radio 2, more traffic to the site, albums sold, members on the mailing list and bums on seats (or jiggling on feet) at gigs. So it's all good! Updated today - links page (the new thunder website, oooooooh) and the gigs page (though more details are to be added with regards duo dates. Don't forget, get your radio at the ready for the Bad Influence Session, BBC Radio 2, the Paul Jones Show on this Thursday (Feb 6th) from 8pm-9pm. Gigs updated for February, please note that the Brook gig on the 21st has been cancelled this month, and some dates so far added for March. Potential gathering on the 1st you loonies? Let me know? The Bad Influence interview is now up on the Get Ready to Rock Website - under the "Rising Stars" section. Bad Influence have been interviewed for the Get Ready to Rock Website - I only found out about the site in relation to the interview but it's quite cool! Lots of interviews, reviews and music news check it out. The BI interview will be up there soon on the special features section under' rising stars'! Go there. Gig list updated too. You lucky lucky southern things. The longer we wait, the quicker it comes! The Bad Influence session will be part of the BBC Radio 2 Paul Jones Show on Thursday February 6th, 2003. Wooohoooo! His show is on 8pm-9pm, Papa George fans tune in on Dec 12th. The session mentioned below is now scheduled for broadcast on 20th February 2003, on BBC Radio 2. Some updates to the gigs page and don't forget to sign up for Bad Influence news by email. BAD INFLUENCE AT THE BBC! The session is due to be broadcast on 27th March 2003 on BBC Radio 2. New look site launched. Currently experiencing technical difficulties with the host of the site so we might have to look for a new home, please let me know if you have problems. A few areas are still underconstruction so bear with me - but the gigs page is up to date!! Bad Influence have been invited to the BBC Radio Studio to record a session for Paul Jones' show. The session will comprise of an interview with the band and several tracks performed live - possibly including some new material. Watch this space for details.